This is the sequel to Lonesome Dove, and it recycles some of the characters that are left alive at the end of that massive tome. We’re told about them on the inside front cover—Woodrow Call, Pea Eye Parker, Lorena—as if this is going to be their story and we’re going to care about them. It’s not and we don’t. At least not until the very end. For the bulk of the novel, the only person I come to care about is Maria Garza. Later, she was to cry and cry over that remark. When she made it, she did not realize that it would be the last thing she would ever say to Benito, who didn’t make it to Chihuahua City, or to the dentist. Less than ten miles from Ojinaga his horse was shot out from under him. Benito tried to run, but the killer roped him and hoisted him up the side of a large boulder. Then the killer cut off his hands and feet, with a machete. The killer loosened the rope and rode away, leaving Benito to bleed to death. Benito crawled almost three hundred yards, back towards Ojinaga, before he died. …I found myself acknowledging that Maria was the only character so far that had managed to win my sympathies. Is this what McMurtry intended? I believe so. For in addition to Maria being the most sympathetic character in the book, much of the on-going subtext deals with the natural conflicts that arise between men and women. Essentially, they cannot understand each other—what it is they want from life and their fundamental motivations. It is only those with the most worldly experience, like Maria, who begin to glimpse the other side. It was another lesson about men: they wanted only one thing, and they were vengeful if they didn’t get it, or enough of it. Later, she was to learn that if someone else got what they wanted, they were even more vengeful. As a grown woman, Maria has learned many lessons about men—she understands them and what they will do. But like all women, she is incapable of understanding why. Here’s an example that underscores that point. The lack of laughter in her life was a thing Maria held against men. She felt she had the temperament to be a happy woman, if she was not interfered with, too much. She knew that it was her fault that she let men interfere with her; yet if she didn’t, there was nothing, or at least there was not enough. She wanted a man to lay with, except if she wanted a man once, she would want him many times. She liked to take pleasure from men, and liked to give it, but when she gave men that pleasure, they came to need it and then to resent her because they needed her. When that happened, the interfering began. Maria didn’t know why men resented the very women who gave them the most pleasure, and gave it generously. It was foolish, very foolish, of men to resent the good than came from women. Still, they did. They’re jealous, that’s why. Any man can tell you that, Maria. But Maria can’t comprehend that. She’s certainly heard the word before, and probably even felt the emotion herself from time to time. But she doesn’t know what makes a man feel jealous when a woman gives him pleasure. It’s beyond her ken. That’s Maria. She is the strongest female character in the book, and her strength over and in the face of men is shown again and again throughout the novel. The most interesting scene in this regard is when Maria, on a visit to Crow Town to find and warn her son Joey about Call coming to kill him, is threatened by a large wild pig, and, armed with a pistol, casually and almost without thinking kills it with a lucky single shot. The pig, she shortly learns, is known as The Devil Pig by the local residents—mostly by women who have been forced into prostitution by their poverty and the predilections of the outlaws and low characters that frequent Crow Town. Maria’s action causes her to be hailed as a kind of folk hero by these women, and when she suggests they butcher the pig for its meat and to help provision her on her on-going journey to find Joey, the interesting scene ensues. Read this in the light of the thematic conflict between men and women McMurtry is exploring. By the end of the morning, every woman in Crow Town was behind Joey’s house, helping Maria finish butchering the giant pig. All of them carried off meat, and then came back and helped Maria smoke hers over a little fire. They were beaten women, none of them young; only Gabriela and Marieta were young. Most of the women were old, within sight of their deaths. They had been thrown aside by their men, or their men had died, leaving them in this bad place, too spiritless to move on. All of them, even the oldest, had sold themselves, or tried, to the men who had passed through Crow Town. Now they were excited, and not just by the meat. The pig had frightened them all. He had made their dreams bad, made them scared when they had to squat in the bushes. They had seen the pig eating dead men, on Hog Hill. They knew that when they died, the pig would eat them, too. Nobody would care enough about them to bury them deep enough, and the pig could even root up corpses that were buried deep. But now the tables had been turned, and it was all thanks to Maria. She had arrived out of the storm and had killed their enemy, the great pig. They had wet their arms with his blood, eaten raw bits of his liver, and waded in his guts, which spilled from his belly and spread over the ground when Maria opened it. There is an argument between the women—one of whom wants to strip and eat the intestines, another of whom who thought that was sick because the intestines undoubtedly contained pieces of the people the pig had eaten. As the women worked, the men of the town came, in ones and twos, to watch the spectacle. None of them said anything. They stood in the wind, watching the bloody women cut the meat. Though she continued to work, Maria kept one eye on the men. They were all watching her, and their eyes were hostile. She knew she would have to leave Crow Town that night, as soon as she had enough jerky to see her home. She was a new woman; the men who watched her cut the pig were tired of the women they had, if they had any at all. Their women were worn out. Except for the two Mexican girls, they were all women whose hearts had died within them. They were broken and they didn’t care what men did to them anymore. Men had used them until they had used them up. The women were excited that the pig was dead, but their excitement would be brief. In the next day, or two days, or a week, they would just be broken women again. Maria knew the men would be after her soon. They would be angry because she had stirred up the women. Most men didn’t like women to be stirred up, about a dead pig or about anything. Life was much easier when women were broken, when they didn’t dare express a feeling, whether happy or sad. It was not something to question; it was just how men were. In the end, I think Streets of Laredo is a book about the spirit of women, which has been broken throughout history by the dominance of men, but which can always rise again, and which must if we are to keep from sliding into chaos. There are other women in the novel that represent this ideal, with Lorena being the one most primary. There’s another scene at the end that well summarizes the divide that exists between the world of men and the world of women, but here it is Lorena that reveals and reflects upon it. In the scene, Lorena wants to know more about Maria—about whether or not she was ever happy—and in this quest she approaches Billy Williams and Olin Roy, two of the men who knew Maria best. The two men were silent. They had known little of what went on in Maria’s marriages. When she was with Roberto Sanchez, her face had often been bruised; apparently he was rough, though Maria had never mentioned it to either of them. Carlos Garza had been a vaquero, off in the cow camps with other vaqueros. Juan Castro had been cheap; besides her midwifing, Maria had done cleaning for white people across the river when she was married to him. Benito had merely been lazy; he seemed to have no malice in him. But was Maria ever happy? Both could remember her smile, and the sound of her laughter, and the look on her face when she was pleased as well as when she was displeased. But was Maria ever happy? It was a hard question. Lorena asked no more questions. She felt she had been foolish to inquire. The two men were probably decent, as men went. Both had clearly been devoted to Maria, else why would they be here, reluctant to leave her grave? But how the woman had felt when she closed the doors of her house at night and was alone with one of her husbands and her children, was not something that men could be expected to know. What Maria had felt in the years of her womanhood was lost. Who would know what feelings she had struggled with as she lost four husbands and raised her children? How could men, decent or not, know what made a woman happy or unhappy? She herself had known little happiness until she had persuaded Pea Eye to accept her. Why she felt she might be happy with Pea instead of with any of the others men who had sought her hand in the years after Gus McCrae’s death was elusive, too. Lorena had thought she’d known what drew her to Pea Eye once, but now, sitting by the campfire in Mexico, she found she couldn’t recover her own reckonings of the matter. She had been right, though, for she had known great happiness with Pea Eye and their children. Probably there was no explaining any of it; probably it had been mostly luck. I find a lot of McMurtry fiction ends this way—with questions about what something might’ve meant, or what two people might’ve meant to one another—and with a simple sense that the line between happiness and sadness, life and death, might be drawn by luck. 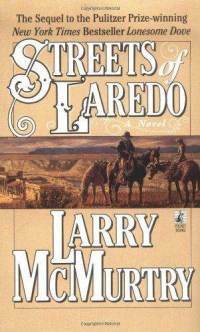 In Streets of Laredo, it is men and women that the line is drawn between—but it is not just between individual people like Lorena and Pea Eye, or Maria and her husbands, but between two different worlds that each a man’s and a woman’s sense of happiness would try to create. This more archetypal tension is Lorena’s real purpose in the book. It is her husband, after all, Pea Eye Parker, that wavers between the worlds created by the two genders—the domestic family life represented by women and that wandering individual life represented by men—when he decides and then regrets his decision to join Captain Call on his hunt for Joey Garza. Lorena sees the essence Pea Eye’s conflict from the very beginning. That was what it was, too: woman against man. Her body, her spirit, her affection and passion, the children she and Pea shared, the life they shared on the farm that had cost them all her money and years of their energy. It was that against the old man with the gun, and the way of life that ought to have ended. Probably there was more to it—it involved the loyalty of fighting men to one another and to their leader, but Lorena gave that no respect, not where Pea Eye was concerned. In Lonesome Dove, Lorena was very much a part of the man’s world. As a reminder, there is a brutal scene in the middle of the book where the young wife of one of the lawmen who has gone off with Captain Call to find Joey Garza is raped by her local sheriff. This Mrs. Plunkert goes there looking for information on the whereabouts of her husband—once too often in the view of the sheriff—and the sheriff, in a fit a frustration and closeted passion, brutalizes and rapes her. The act shatters her. It destroys her sense of her own virtue and even the love she feels for her missing husband and the child growing in her womb. In an act of desperation, she eats rat poison until she curls up in pain and dies. When Lorena hears about the death, she is forced to reflect on the brutalization she herself had received at the hands of men throughout her life—some of it much worse than what had happened to this Mrs. Plunkert. Although the circumstances of Mrs. Plunkert’s travail might seem lighter, Lorena knew they had not seemed at all light to the young woman who had so promptly taken her own life. Mrs. Plunkert must have felt that her happiness and her husband’s happiness were forfeit anyway. She had become hopeless. Lorena knew enough about hopelessness. She did not want to be reminded of it, not even a hopelessness experienced by a young woman she had never met. What the death of Mrs. Plunkert meant was that hopelessness was always there. There was never a way or a time one could be safe from it. If Pea Eye dies, or one of her children, she knew she would have to feel it again. But in Streets of Laredo, Lorena is no longer part of the man’s world. She has quite consciously rebelled against it and now resides apart from it. And her defining conflict must finally come with Woodrow Call himself. There is actually a great deal of this book that I did not like. The first 390 pages or so feels like little more than wandering around the narrative landscape—almost like McMurtry is trying to reflect Call’s wandering quest for Joey Garza in the pace and unconnected scenes of the story. It might’ve been done more effectively, but at times it seems amateurish and sloppy. Characters wander in from literally nowhere. In the morning when she awoke, the Captain was looking at her out of feverish eyes. Lorena looked at the leg and then looked away. “You might bleed to death,” she said. He’s a man and he has a job to do. Lorena felt a flush of disgust. The man was all but dead and might be dead before the day passed, or even an hour. He could barely whisper and his arm was ruined; he had a bullet in his chest that made his breath sound like a snore. Yet he still wanted to kill. The sympathy Lorena had felt for him in his pain, went away. Not all of it, but much of it. She’s a woman. To her, life is about growth and happiness, not death. Call was surprised by the anger in Lorena’s voice. Lorena was surprised by it herself. It came from memories and from times long past, from things she had felt about Gus, and things she had felt about Jake Spoon. The very man before her, Captain Call, the man with the ruined arm and leg and the deep chest wound, had himself hung Jake Spoon, his friend. If Gus McCrae hadn’t killed to save her, she would have died alone at the hands of cruel men, long years before. She would have had no husband, no children, no pupils. Killing was part of the life they had all lived on the frontier. Gus’s killings had saved her, but Lorena still felt a bitterness and an anger; not so much at the old, hurt man laying by the campfire as at the brutal way of life in the place they had lived. But that way of life was necessary, wasn’t it? At one time, at least. She and Clara sometimes daydreamed of making a trip to England together to see civilization. They meant to visit Shakespeare’s birthplace, and to see a play. They had amused themselves in the Nebraska evenings by imagining what they would say if they happened to meet Mr. Browning on the street, or Mr. Carlyle. Yet here she was, not with Clara in a theater or a nice hotel in London, but on a bleak prairie, with not even one house within a hundred miles, caring for an old killer who wanted her to cut his ruined leg off so he could get well and kill again. She had studied and educated herself, but she had not escaped. When she looked around and saw where she was and remembered why she was there—because this man had taken her kind husband to help him kill a train robber—she felt deeper anger still. “I’m tired of it,” Lorena said. “I’m tired of it, Captain! You oughtn’t to have taken my husband. He’s not a killer. You and Gus were the killers. I loved Gus McCrae, but not like I love my husband. Our children love him and need him. You oughtn’t to have taken him from us. Gus and Call, they are the pioneers, the killers who must venture into the wilderness if it is to be tamed. Lorena loved them once, when they were needed, but now with women comes civilization, and Lorena wants no more of that old way of life. She yearns for the new, the one symbolized by Pea Eye and her children. Call was sorry he had said anything; better to have stayed quiet until he died. Lorena was risking her life to help him, and Pea Eye was risking his life, too; and yet he had angered her. There was justice in what she said, too. He shouldn’t have taken her husband. He had taken him and wasted weeks of his time and put his life in jeopardy, and for nothing. “The Garza boy is a killer,” he whispered. “I don’t care,” Lorena said. “There’s killers and killers and killers out there. My husband’s got nothing to do with that. Indeed. Pea Eye is a civilized man. Call remembered the fury Clara Allen had directed at him in Nebraska, as he was leaving her ranch with Augustus’s body to bring it back to Texas. Now another woman, and one who was putting herself to great trouble to save him, was just as angry, if not angrier. He didn’t know what the flaw was in his speech or in himself that brought up such anger in women. There is no flaw. It’s just the way he is. But the fury was up in Lorena. He saw it in her eyes, in the way her nostrils flared, in the stiff way she held herself. Call remembered well enough. Gus and Jake and Dish and many men in Lonesome Dove had visited Lorena. In those days, cowboys rode fifty miles out of their way to visit Lorena. She was a woman fitted for the life of pioneer men. Call didn’t know what was wrong. Lorena had clenched her fist, and if he had been well she might have hit him. But the Garza boy was a killer, and a deadly one: he killed frequently and without pity, so far as Call knew. He had been hired to stop the boy’s killing. That was his job. Getting well in order to do what he had been hired to do seemed a reason to live; though when he took stock of his actual condition, he knew it was unlikely that he would ever go on the hunt for a killer again. He probably wouldn’t live anyway—why was the woman so angry? She changed. Why can’t he? That, is the essence of the tension in Streets of Laredo. Having tamed the frontier, some men cannot tame themselves in the way all women seemed predisposed to do.